Who’s to decide when a city has really pulled together, gathering at least a few of its cultural tendrils into a civic identity that can cause visitors to feel connected to something vital and foreverafter refer to it as unforgettable? Certainly not me. Certainly not after just a few days exploring. Yet here I go, musing about Arequipa, Peru, despite my lack of qualifications. Arequipa has the feel of a way station. A very nice way station with oh-so-lovely architecture and oversized food portions, but still a place where people are only lightly living in the moment because they’re on the move to somewhere else, or at least wish they were. Things feel disjointed, hollow, and a little half-assed. Why is Tony Danza a mustachioed blind bag man? The fact is, Arequipa is a way station. Tourists pass through on their way in and out of Colca Canyon. On the way in, folks may not be fully present, thinking of trails and blisters yet to come. On the way out, they’re likely to be distracted by sore legs and mild dehydration. Maybe the lack of a civic oomph I feel is because Arequipa sits in the path of lung-searing, life-ending lava. The city’s 1 million-plus residents have had to embrace a fine-by-me attitude to living just 11 miles (17 kilometers) from a powerfully deadly geologic force: the El Misti volcano. That much blasé in one place will up the area’s ho-hum. 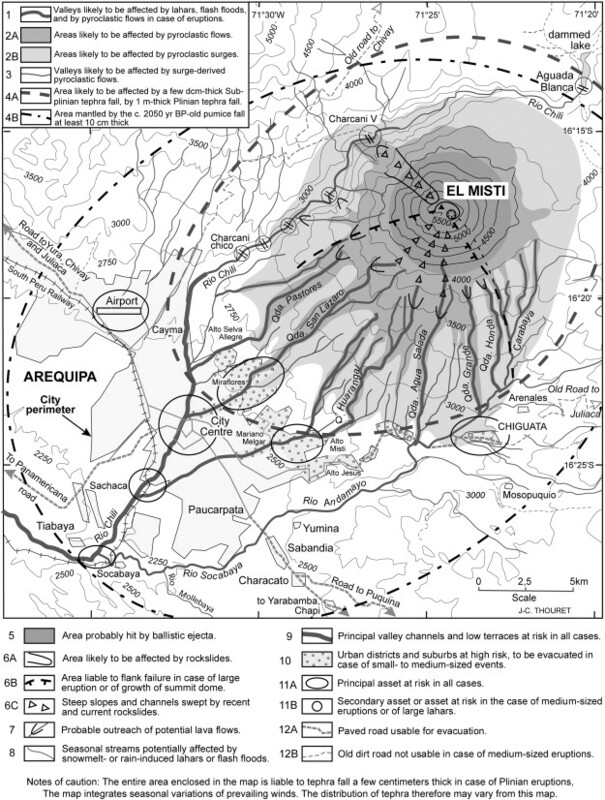 We all live with the chance of death everyday from many corners, but in Arequipa death is visible, large, and very very close (just look at this map of Arequipa showing where the fire and brimstone is likely to fall). How can anyone truly commit to anything under those circumstances? Is the A for anarchy or apathy? I also have a suspicion that Arequipa feels off because, like so many other fast-growing cities, the automobile dominates. Peru’s love for red VWs cannot be understated. The more unusual blue VW. There are buses, collectivos, and combis but the mass transit options are massively outnumbered by cars and especially predatory taxis. Results are typical: traffic, air pollution, and relentless honking that turns all my emotions into one monolithic urge to rampage. Worse, the taxi drivers are distrusted, so much so that when we arrive in town at the bus station, a pair of armed police officers write down our ID details and the taxi driver’s information before letting us speed off. It is an unsettling welcoming committee. I’m looking for passion. Not just the kind of passion that makes you stand up and take notice, but the bigger, bolder kind that makes you do a Tom Cruise leap onto your chair. If Arequipa’s got passion, I’m not picking up on it. This could be as much my fault as Arequipa’s as it’s the end of our Peru trip and I’ve got all sorts of weariness going on. Perhaps I just missed Arequipa at its best. I hope that there’s a fabulous side to the city that residents keep secret from visitors, hidden away like the family adobo Arequipeño recipe. Maybe I’m simply not worthy of knowing the real Arequipa. Every aspect of this adventure sounds so enthralling You must have some amazing memories and have definitely convinced me that I need to travel to Peru. I’m glad to hear that my storytelling has inspired you to visit Peru, I’m so flattered! Please do visit Peru, I’m already thinking about a return trip, it was so much fun.